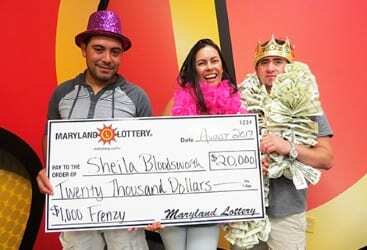 Sheila Bloodsworth, a 48-year-old cook from Nottingham, is rolling in the dough after winning a $20,000 prize playing a $1,000 Frenzy scratch-off from the Maryland Lottery. The culinary breakfast specialist found her lucky instant ticket when she stopped by the Nottingham Shell at 7533 Belair Road to get gas and buy $1,000 Frenzy scratch-offs. The $10 game is her favorite Maryland Lottery instant ticket. After reaching home with three scratch-offs in hand, Sheila tried her luck. Sheila said she immediately called her family to tell them the good news. She feels blessed about her win and plans to take a few family member and friends out to dinner. The rest of her prize will go toward bills and into savings, she said. The $1,000 Frenzy instant scratch-off ticket came out in May. The popular scratch-off has five $100,000 top prizes, seven $20,000 and 14 $10,000 prizes available.